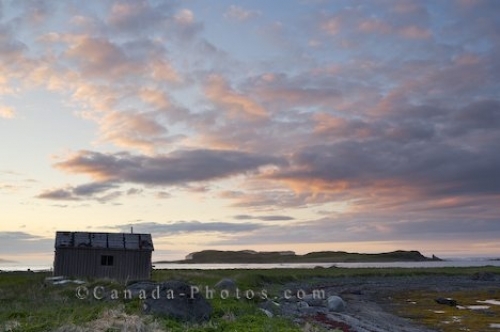 A soft lighting at sunset highlights the clouds lingering over the coastal shores of the town of L'Anse aux Meadows in Newfoundland Labrador where an old rustic shed stands. The rustic shed blends in nicely with the layout of this Viking town as the beach widens at low tide and the sunset hues filter across the sky. From the coastal shores of L'Anse Aux Meadows, the scenery is beautiful as the islands highlight the area and the movement of the ocean crashes against the jagged rockery along the beach. This rustic town was discovered in 1960 as the site of a Norse village where archaeologists found structures and artifacts dating back to viking years. In 1977, L'Anse aux Meadows became a National Historic Site and many visitors to Newfoundland Labrador find this one of the most intriguing places to see. A world of amazing discoveries and stunning scenery especially during the sunset hours. Picture of an old rustic shed along the coast shores of L'Anse aux Meadows in Newfoundland Labrador at sunset.